How large is the external processing box set to ship with PlayStation VR - and what does it actually do? Recent reports suggest that it's quite a meaty piece of kit, "about the size of a Wii" according to Polygon's Brian Crecente. We thought we'd look into this, sourcing full dimensions for the device, a complete list of the inputs and outputs, along with other new information on the PSVR hardware. Based on the development hardware with game-makers now - which may or may not change on the final retail design - we can confirm that the box measures up at 140x140x35mm. By comparison, the Wii measures 215x157x44mm, almost 2.2x the overall volume. A fair bit smaller then, but significantly larger than the box we saw on the first-gen Morpheus prototype. A small power supply is also included in the development kit - that's a 12v unit rated for three amps. This is not insignificant. 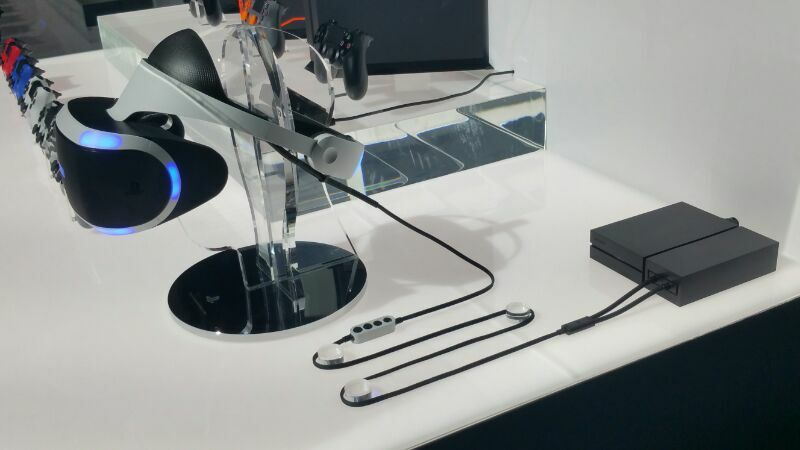 The external processor sits between the headset and the PS4 and in terms of IO, the rear of the unit features the power input, HDMI input and output (for the 'social screen' functionality) along with a USB port, which also connects to the PlayStation 4. The front of the device features bespoke dual outputs to the PlayStation VR headset. The Polygon report says that the external processor looks a lot like the image tweeted below, from VR Focus. Having seen development hardware first-hand, we can confirm that it is, in fact, entirely identical to what's pictured here on the bottom right. It's a substantial piece of kit then, but the real story here isn't so much about how large it is, it's more about why Sony felt the need to enlarge the original design and what that means for us as players. In terms of the core PSVR spec, only one key aspect has changed since its initial reveal with the much smaller processing box - and that's the refresh rate of the HMD's display: Sony has moved to a full 120Hz OLED panel, and we can assume that the PS4 is outputting 1080p120 on 'native' refresh software. So the question is really, what is the external processing box actually doing? This is all conjecture for now but there's certainly very strong evidence beyond the basic dimensions to suggest that the external box has a reasonable level of processing power. We can confirm that the current hardware is actively cooled, meaning that the chip inside is powerful enough to require assistance with heat dissipation. The fan sits on the rear of the box and is around 25mm in diameter. We're told by those using the hardware now that its noise is not intrusive. However, despite the active cooling, we shouldn't expect too much from the external processor - core graphics rendering for VR all takes place within the PlayStation 4 hardware itself and it's going to be down to developers to work within existing limitations to get the best results. But from our perspective, the idea of computationally expensive, latency-sensitive tasks being offloaded to the external box is a good one, and should produce a better overall experience. It certainly represents a sizeable investment from Sony - and we can't help but wonder what this may mean for the basic build cost, and by extension how much PlayStation VR will cost at retail.